If you think there are no mountains in Paris, think again! I had been aware of a race in Paris that historically finished up the Eiffel Tower and I’d always been fascinated by the idea of competing. Over the last few years the race had finished near to the Eiffel Tower, but this year the finish line returned to the first floor. As soon as I heard, I immediately signed up and was excited to visit the city for my first time since the Paris marathon in 2005. 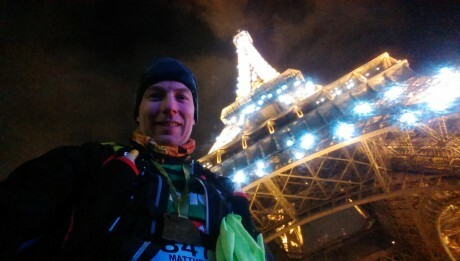 Back then, I’d run the marathon with James Bingham (Ring O Fire) and we decided to climb the stairs of the Eiffel Tower immediately after the race. I guess we are not the only people to have good ideas! I travelled out on the train with fellow Serpentine member Peter Bowles. On arriving in Paris via the Eurostar we headed to the Expo and registered. The whole sign up process was not entirely straightforward as the registration area was hidden at the back of a huge outdoor expo, and we later found out that we could have had our races packs sent through the post. Good to know in retrospect. After walking 13.1 miles to register, find food and our respective hotels, it was time to hit the hay. 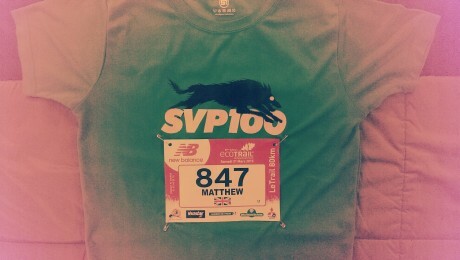 This was one race where an early night was not necessary though. With a start time of midday, the next morning was going to be relatively civilized and leisurely compared to most other long distance events. On the morning of the race we headed out to Saint Quentin-en-Yvelines via the Metro, train and coach. The journey was straightforward, with Eco Trail de Paris signs at the train station and plenty of coaches to transport us to the start. 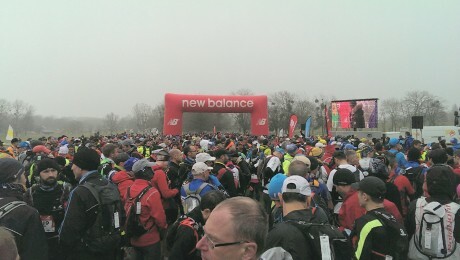 The morning was exceedingly chilly and we tried hard to keep warm whilst waiting for the start of the race. As midday approached, we were raring to go, keen to generate some body heat. I’d met up with a few other Serpentine runners, some of their running friends, and also Tobias Mews who I’d met during the Marathon des Sables in 2011. Tobias had not done any ultra running for a while and claimed to be out of practice, so we decided to set off together to keep one another company. We started the race wrapped up in waterproof layers and beanies, but after a couple of miles we were both overheating. We stopped and stripped down to t-shirts before continuing. As we were running in a field of approximately 2,000 or so other competitors, the front of the pack had shot off at an incredible pace and it was hard not to go with the flow. I looked at my watch at one point and noted that we were running at a 7.5 minute per mile pace. This was going to be too fast for me over a distance of 48 miles, but I figured it would be interesting to see how long I could keep it up. The route was most definitely trail and there were many rutted paths and tree roots to avoid. Tobias momentarily lost concentration whilst taking on board food and went down hard. Fortunately he was not too badly hurt, and with only his pride dented, he dusted himself down and continued. He was not the only person I saw trip or fall throughout the day, so I imagine where must have been quite a few sprained wrists, twisted ankles and grazes amongst the field. Having injured myself a week earlier in a snowboarding crash, I decided to be extra cautious, as I was already running with an immobile shoulder. I knew any trip could easily end the race prematurely. After around 10 miles my legs started to feel heavy, so I bid Tobias farewell. A week of snowboarding ahead of an ultra is probably not the best way to taper, but life is short and there are too many fun things to do. I plodded on and hit the first aid station at approximately mile 13. The aid stations on the whole were very well stocked with fruit, chocolate, cake and various other snacks, along with Pepsi, energy drinks, water and hot drinks. However, this might be a tough race for a complete beginner, as the initial aid stations are a long way apart, and the subsequent aid station was at 27 miles and only had water. This is one race where you definitely need to carry your own food and ensure that you have an adequate water supply. The race suggests that you should have the capability of carrying 1.5L which makes absolute sense. If you love hilly trails through woodland, you will absolutely love this event. 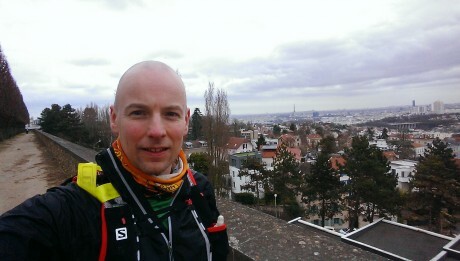 The route is very undulating and the scenery does change every now and again as you run past an observatory and are treated to some stunning views over Paris, along with a tantalising glimpse of the Eiffel Tower around 28 miles in. 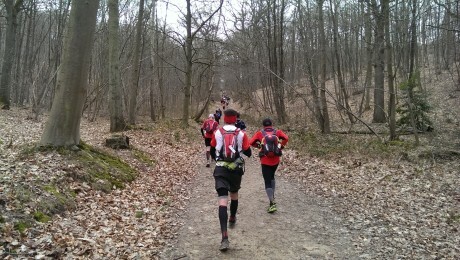 The last 10k was also nice and flat alongside the river Seine on hard paths, to add a bit of variety. Given the midday start time, most runners will be finishing in the dark and head torches are an essential piece of kit, both to navigate the woodland trails, and for safety along the roads leading into the centre of Paris. The route was really well marked with reflective tape and it would have been difficult to take a wrong turning, even in the dark. The real USP for this event is the finish at the Eiffel Tower. From 6-7 miles out you can see the tower looming in the distance with search lights rotating around the upper platform, making it look like an oversized lighthouse. It’s hard not to increase your pace over this stretch as your excitement grows with every step. On approaching the tower there were thousands of spectators and tourists, and there was a festival-like atmosphere at the base. I sprinted the last section under the base of the tower as I felt so euphoric. On reaching the furthermost foot of the structure, I was handed a ticket which provided entry to the staircase. It was only a matter of climbing ~370 stairs and the finish would be in sight. Having completed the Tower 42 challenge a week and a half earlier, in addition to doing some mountain running whilst away snowboarding, my legs felt strong as I hit the staircase. I passed at last 5 or 6 other runners who were struggling hauling themselves up. As I rounded the final corner, I dashed to the line, where I was handed a medal and finisher t-shirt by some brave volunteers stood out in the cold. The views from the finish were spectacular and I was relieved to finish, despite the stomach problems, blister and fatigue I experienced during the race, on top of the snowboarding injuries. I was slightly disappointed with my finishing time of 9hrs 43, but this still resulted in a place of 693 out of 1,559 finishers. Special mention goes to my friend Ali Watson who came 20th overall with a spectacular time of 6hrs 42. He was aiming to finish in time for the second half of the rugby! In summary, the race was very well organised and clearly marked. The route was beautiful and the finish was iconic and highly memorable. This is a tough race for absolute beginners with ~1,400m ascent over the 80k and not as friendly as most British ultra marathons I’ve experienced, as other runners did not seem very chatty. Having said that, another runner very kindly donated a plaster at the second aid station, as there were no medical staff at this location. It’s definitely one to add to the bucket list though. 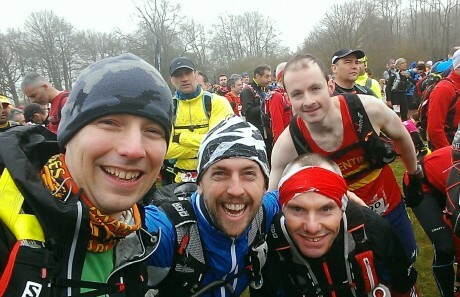 If you don’t fancy running 80k, there are also 50k, 30k and 18k options, so there really is something for everyone. Also, it’s probably quite an easy set of races to ‘sell’ to your friends and family, whether they are planning to run or support. Lessons learned from the event. Don’t run long distances without plasters in your backpack. Running any distance with blisters or worse is absolutely no fun at all. Make sure you have a decent head torch if you are going to be running over technical terrain in the dark. Finally, if you are having stomach cramps, continue to try taking on board food and water. The cramps will hopefully subside, but you don’t want your energy levels to completely crash at any point during the race.